Originally posted: June 16, 2018 . Last modified: April 7, 2019 . Beef tacos are a simple and tasty dinner option that will please even the pickiest of eaters. Make these family favorites even easier by using the Instant Pot! 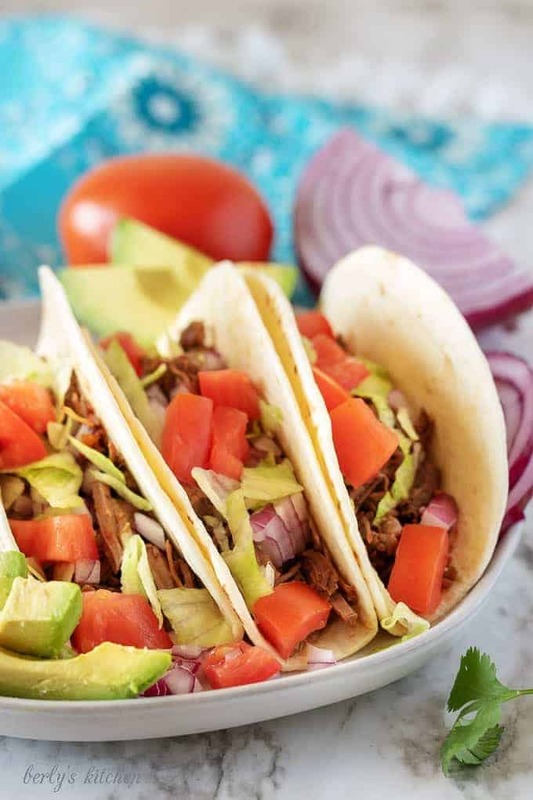 Our Instant Pot Shredded Beef Tacos only take a few minutes to brown the beef then simply dump in the remaining ingredients and done. You’ll have tender, flavorful beef tacos with all your favorite toppings without having to babysit a pan on the stove top. Who doesn’t love a good beef taco? I’ve met a few people throughout my life that don’t, but honestly, most people go crazy for these things. There are hundreds, maybe even thousands of different taco varieties. Growing up, we used ground beef every time we had tacos for dinner. Crunchy taco shells were also a favorite. Now that I have my own family, we change things up a bit. 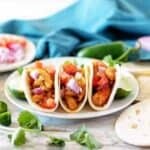 A few weeks ago, we made Instant Pot chicken tacos, and they were a huge hit with our friends and family. After posting the recipe to our Facebook page, a reader asked if we had a similar beef taco recipe. Luckily, I’d already started thinking about this one. Before sharing this shredded beef taco recipe, I wanted to try it a few times to make sure it was exactly as I’d imagined. The meat had to be perfectly tender and juicy, because nobody likes dry, bland taco meat. Not to mention, it had to be super easy to shred. This taco meat needed to appear as though it had slow cooked all day even though it was pressure cooked. Lucky for me, these beef tacos have turned out perfectly ever single time. Here’s how I make them! These shredded beef tacos are a cinch to prepare. The only downside is the cook time. It’s a bit on the longer side, so it’s a good idea to start this dish well before everyone gets hungry. Trust me, it’s worth the wait! Start by cutting the beef into chunks about 1-2 inches in size. Trim any large pieces of fat off the meat. Any fat running through the meat is fine. It will impart flavor and dissolve as the beef cooks. After the meat is cut, place the pieces into a large bowl and mix with the garlic powder, onion powder, salt, and pepper. Toss it to coat, and set aside. Next, set the Instant Pot on Saute. Let it get hot, then add the vegetable oil. Canola or avocado oil will also work, but we prefer vegetable or canola for this recipe. Here’s why. John and I were chatting about Instant Pot recipes a few days ago. We make a ton of them, and I was a little aggravated that so many of my shirts get ruined by splattering grease and oil. It seems that my Instant Pot gets super hot on the Saute function and most recipes happen to call for butter or olive oil. John reminded me that olive oil and butter don’t have a high smoke point, so it’s not a great choice when cooking on high heat. I was looking around for an article with a chart of smoke points and this is what I found. It’s really helpful when deciding which oil to use. Ok, now back to the recipe. After the vegetable oil is hot, add the onions. Give them a good stir for a minute or two, just long enough for them to soften. Then, add the beef and garlic. Stir the beef mixture until all sides of the meat have browned, then turn off the Instant Pot. Add the taco seasoning, beef broth, and tomatoes and green chiles. Close the lid and and set to sealing. Cook the beef for 40 using the Meat/Stew setting. If your pressure cooker doesn’t have that setting, use manual pressure on high for the same amount of time. After the beef cooks for 40 minutes, allow the pressure cooker to complete a full natural release before removing the lid. Once the natural release is complete, open the lid and use two forks to shred the beef. Don’t be alarmed at the amount of liquid in the Instant Pot. It’s supposed to be there. These shredded beef tacos are meant to mimic tacos you’d purchase from a street vendor. Those beef tacos are typically held in their juices until they’re served. Serve the shredded beef in tortillas, taco shells, on chips, or along side your favorite toppings! The best cut of meat that I’ve found for shredded beef tacos is a chuck pot roast. A chuck pot roast has just enough marbling which softens the meat as it cooks. The beef will be juicy, tender, and pull apart with ease. I’ve also used a beef tender roast, and it worked well. Don’t skip the step about seasoning the meat. Salt helps break down the fibers in the meat making it easier to chew. Not to mention, the extra seasoning gives the meat a boost of flavor! Our recipe uses one package of taco seasoning. However, if you prefer a more robust flavor, use an additional package of seasoning. Just a word of caution, adding additional seasoning packets will add more sodium. 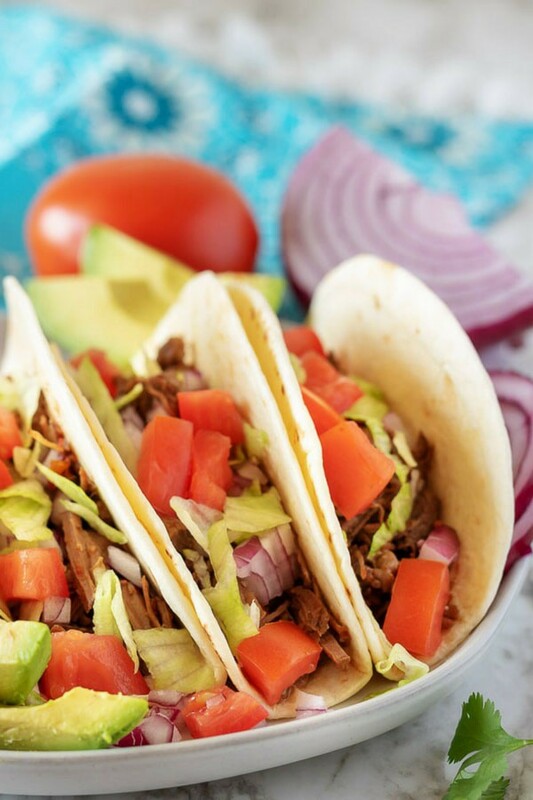 Our Instant Pot Shredded Beef Tacos only take a few minutes to brown the beef then simply dump in the remaining ingredients and done. Set the Instant Pot to "Saute," and allow to get hot. Add the oil. Then add the onions and stir for 1-2 minutes until soft. Add the beef and garlic. Continue to stir until all sides of the beef are browned. Add the taco seasoning, beef broth, and tomatoes and green chiles (undrained). Close the lid and set to "Sealing." Choose the "Meat/Stew" option and set for 40 minutes. If your pressure cooker doesn't have a meat/stew button, choose manual/pressure cook on high for 40 minutes. After the meat cooks for 40 minutes, allow the pressure cooker to complete a full pressure release. Next, remove the lid and use two forks to shred the beef. Serve the beef on tortillas, shells, or chips. Top with tomatoes, onions, cilantro, sour cream, or your other favorites. 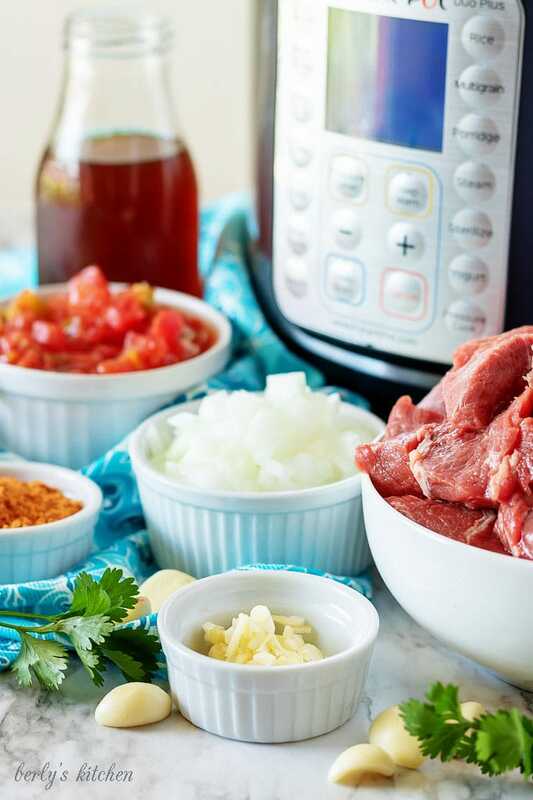 Reserve the juice from the Instant Pot for any leftover beef. Place remaining beef in juice and transfer to an airtight container. Store in the refrigerator for up to three days. 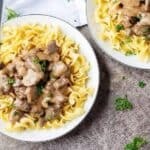 *We used a 6-Quart Duo Instant Pot for this recipe and have not tried other sizes or models. Substitutions or adjustments may change the outcome of the dish. *In the event you are concerned about sodium intake, consider using a low-sodium or sodium-free taco seasoning. *Step 1 of the instructions regarding seasoning the meat can be done in advance. Simply season the meat and place in a sealed container in the refrigerator for 1-3 hours ahead of time. *Calories are approximate and only account for the the ingredients listed minus the optional garnishes. I have never tried a taco I did not like. These sound delicious. I have a regular pressure cooker, so I will give this recipe a try in that. I love my instant pot so I’m definately going to be making these!! i typically use flank steak or iron steak when making tacos but I’ll have to give chuck roast a try! Sounds like the perfect dinner recipe!! Can’t wait to try these!! What a great way to make tacos! The instant pot makes everything so much easier! Taco Tuesday can’t come soon enough for these. My husband can’t get enough of recipes like these and I love all the ‘hands-off’ time it has on it. Love love LOVE green chiles! I always add them to Mexican dishes like tacos and enchiladas! I love beef tacos and this one is a flavorful one using shredded beef. This is a simple,put together meal for a weeknight. Love it! IThese tacos look absolutely mouthwatering! 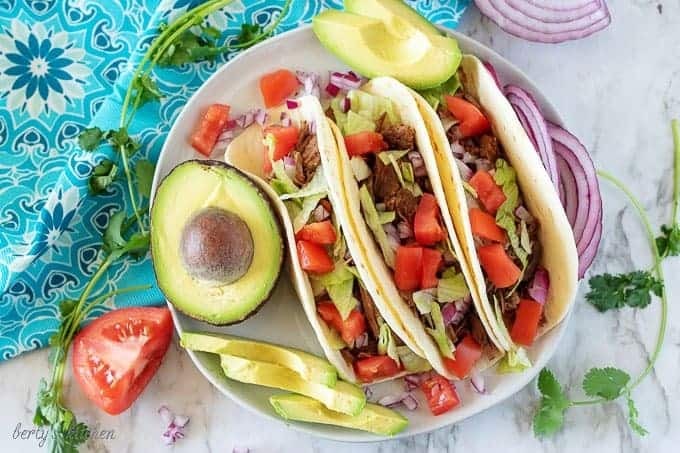 My family loves tacos and I bet they ‘d love these 🙂 I’ve just bought an instant pot, so I will surely make these soon! YUM! These tacos look soo good! They will be perfect for my next summer get together! 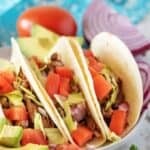 I can’t resist a taco, and these look so good, my family would devour these! Can’t wait to try them! My 3 year old is obsessed with tacos AND with our Instant Pot. He’s going to love this recipe so much — we have tacos once a week in the summer and I’m always searching for new recipes! Oh my goodness. My hubby is gonna die when I make these tacos for him. Thanks for the recipe!!! I know what I am making for dinner this week! I have been looking for great instant pot recipes. I love having dinner on the table in a flash! I can never get tired of tacos! Going to give this recipe a try for this week’s Taco Tuesday! 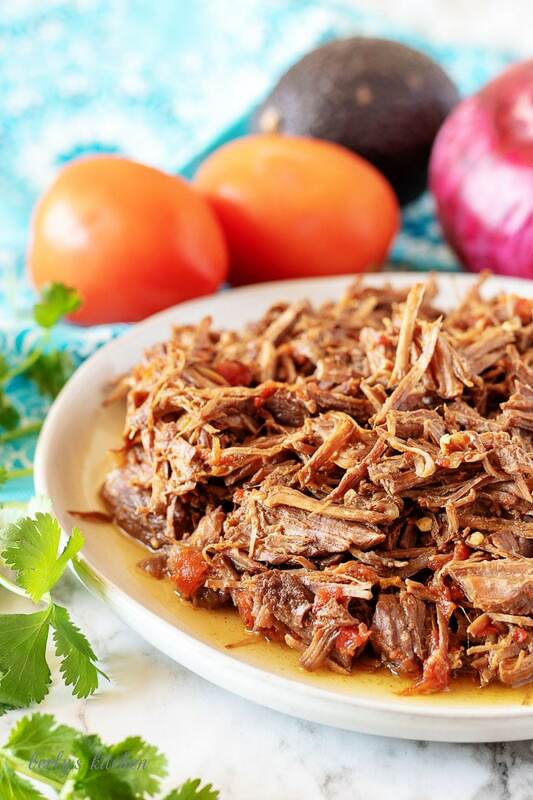 This is the perfect shredded beef recipe! 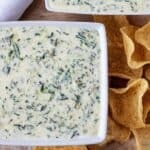 We made nachos with it, but it would be delicious in tacos, burritos or even enchiladas! So tasty and tender and juicy!